On the right upper corner there is a red button with the inscription login. After clicking on the button, another field opens for registration in the ticket-onlineshop. A successful login is possible by entering the username/e-mailaddress and password. Anyone who hasn’t bought tickets before has to register, at the latest after selecting the desired tickets. WHICH ACCESS DATA DO I USE FOR THE LOGIN? Please log in with the access data you know. All season ticket holders (Dauerkarten-Inhaber) have recently received a letter with their access data in season 2014/15. All annual card holders (Jahreskarte Steh Süd-Inhaber) receive their access data by e-mail each year with the commitment. Anyone who has ever bought tickets in the ticket-onlineshop, whether season tickets, matchday tickets for home or away matches or tickets for stadium tours, is registered and has a user account. Every registered person should use the known access data. Please don’t create a new account, as this leads to duplicates in the system. I'M NEW. HOW DO I GET ACCESS DATA? Anyone who has never ordered tickets or created an account will have to do this during the ordering process. After selecting the desired tickets, you will come to the registration page to create your own account. Please enter your personal data in order to register in the ticket-onlineshop. Please note: When entering your data, the fields must be completed, otherwise there is no successful booking guaranteed. Confirm your data with Let’s go!. Alternatively you can register now. Click on the red button on the right with the inscription login . This opens another field for registration in the ticket-onlineshop, where you can create your account for orders in the ticket-onlineshop. If you have already bought tickets in the past, please do not create a new account. Use the access data you know, otherwise a new registration will lead to duplicates in the system. Important: If you would like to use the membership pre-sale but you don’t have access data to the ticket-onlineshop, please contact the FC St. Pauli Servicecenter via e-mail to kartencenter@fcstpauli.com timely before the start of the sale. Anyone who creates an account as a member himself must assume that the games are not visible to him during the membership pre-sale. As a consequence tickets possibly can‘t be booked. HOW DO I RECEIVE A NEW PASSWORD? In the upper right corner there is a red button with the inscription login. After clicking on the button, another field opens for registration in the ticket-onlineshop. You can use the Forgot your password?-function to reset the password by entering the username or e-mail address. Afterwards you will receive an e-mail with a link to reset the password. The new password must be in accordance with Eventim's password policies. Otherwise, even if you don't know your username, you can ask the the FC St. Pauli Servicecenter via e-mail to kartencenter@fcstpauli.com for an authorisation code. The section my account is available after a successful login. In addition to the administration of your personal data (master & address data), you can change your personal access data like the password by clicking on security. You will find also a list of your previous bookings made in the ticket-onlineshop as well as an overview of the status of the booking in the section orders. And finally you will also have the chance to resell a ticket by clicking on secondary market. WHY DO I HAVE TO SPECIFY MY TELEPHONE NUMBER? In case of unexpected problems with the booking, the FC St. Pauli ticketservice can contact you personally to clarify the problem. WHICH TICKETS CAN I BOOK ONLINE? In this ticket-onlineshop you can buy match day tickets for the home games of the first men's team of FC St. Pauli, which currently plays in the second Bundesliga. In addition to the Bundesliga matches, tickets to test matches held at Millerntorstadion will also be distributed via this ticket-onlineshop. For each sale the FC St Pauli publishes a news that informs about the sale dates and the modalities of the sale. Basically tickets go on sale after the exact date was announced by the DFL. Only in exceptional cases not fixed scheduled games go on sale. HERE you will get more information to the matchday ticket sales. The sale of FC St. Pauli away games tickets varies from match to match depending on various factors (e.g. the attractiveness of the opponent team or the capacity of the guest block). HERE you will get more information to the away games. HOW MANY TICKETS CAN I BUY PER MATCH? The maximum order quantity of tickets will be published in the sales news and varies from match to match. Usually you can buy up to four tickets (but maximum one standing ticket). For test games there are usually no restrictions. CAN I BOOK TICKETS FOR DIFFERENT GAMES IN ONE PROCESS? Of course tickets for different home matches can be booked in one order process. After you have chosen your desired tickets for one match and put them in the shopping basket, there is the possibility to add more tickets for other matches. For this you have to choose the option continue shopping in the shopping cart. The order can be concluded by clicking on checkout. The maximum order quantity of tickets will be published in the sales news and varies from game to game. WHAT DO I NEED TO SELECT A DISCOUNT? A discount on your ticket can be selected directly after choosing your tickets or later in the shopping basket. There is a price /concession check box where you can select the discount. The following persons are entitled to a discount: children (7-12 years), pupils, students, trainees, volunteers (for example FSJ), unemployed, pensioners and handicapped persons (from GdB 50). The following papers are accepted: student cards, handicapped ID cards, pension certificates as well as current performance and approval notices from the employment and social welfare office. Holders of discounted tickets have to show a valid proof and their photo ID at the entrance to the stadium. During the booking process it is possible to reduce tickets. For some price categories (e.g. tickets with a restricted view or best seats) are no further reductions possible. CAN I STILL MAKE CHANGES TO MY SELECTION IN THE SHOPPING BASKET? You can change the selected discount in the shopping basket again. You can also remove your tickets from the shopping basket by clicking on the trashcan icon. To add more tickets to your shopping basket, click on continue shopping . If you would like to book your selected tickets in the shopping basket, then please click on proceed to checkout. WHAT I HAVE TO DO AFTER ENTERING MY DATA? After you have entered all the your required data for the booking, please check it again in the booking overview (verification). If your data is wrong, you can still correct the invoice address, the shipping address and the delivery & payment by clicking on edit. If all the information is correct, you can complete your booking. Additionally you agree by clicking on book now . WHEN AND HOW DO I RECEIVE A RECEIPT OF BOOKING? At the end of the booking process after clicking on buy now your order will be confirmed. You will also receive the invoice for your order and the GTTC via e-mail. You can also check your successful bookings under . Please keep the invoice in case of inquiries. WHAT ARE TICKETS WITH A RESTRICTED VIEW? Some seats in the stadium are restricted because there are roof supports or railings which make a bad sight. When choosing these tickets in the ticket-onlineshop these places are marked in the colour light green. For a ticket with a restricted view you pay a discounted price. The ticket also has the addition "Sichtbehindert" printed on it. WHY DO I HAVE TO STAND IN THE SEAT AREA G1? The block G1 is located in the seating area of the Gegengerade. The special characteristic of the block G1 is that all ticketholders have to stand. Although the tickets are sold at the regular seat price, you have no right on a seat, even if a seat is selected in the booking process. The ticket also includes the words "Kein Sitzplatzanspruch" or "Freie Stehplatzwahl". CAN I BOOK VIP-TICKETS ONLINE? VIP tickets for the home matches are provided and distributed by our marketing agency, the U! Sports GmbH. The Séparées (lodges) and business seat areas are located on the Haupttribüne (main stand) and Südtribüne (south stand). Business seats are available in blocks H4-H6 (Haupttribüne) and S2 (Südtribüne). Basically VIP-tickets can be requested for all home matches, independent from the regular ticket sales in the public sector. WHICH SECTION IS FOR GUESTS? The away stand in the Millerntorstadion is located on the Nordtribüne (north stand). Block G and H are intended for away fans who want to stand, Block N5 to N7 for those who want to sit. If the away team doesn’t need the full contingent of tickets, the away stand will be made smaller. As a consequence the home section will be enlarged and more tickets can be sold to fans of FC St. Pauli. Please note that all other areas except the away stand are for fans of FC St. Pauli. Merchandising of the away team is only allowed on the away stand. CAN I BUY TICKETS FOR THE AWAY STAND ONLINE? Tickets for the away stand in the Millerntorstadion are sold exclusively through the away club and their distribution channels. Under certain circumstances, there may be a sale of away tickets on match day, if the contingent wasn‘t completely sold in advance. CAN I BOOK TICKETS FOR DISABLED AND VISUALLY IMPAIRED PEOPLE ONLINE? Match day tickets for wheelchair users and the visually impaired people are distributed from the FC St. Pauli according to specific criteria. These tickets can’t be booked via the ticket-onlineshop. The wheelchair users are located in block R1, R2 and R3 on the Haupttribüne (main stand), the visually impaired people sit in block G3 on Gegengerade (back straight). HERE you will get all information to wheelchair-tickets. HERE you will get all information to tickets for visually impaired people. ARE THERE ANY OFFERS FOR FAMILIES OR GROUPS? For each game of the season there is the possibility for families to buy family tickets in block N1 on the Nordtribüne (north stand). It is not possible to book family tickets via the ticket-onlineshop. Instead you can book them by telephone via the FC St. Pauli ticket service from eventim or at the FC St. Pauli Kartencenter. HIER you will get more information to familiy tickets. Due to the high demand of tickets, group orders are usually not possible. Exceptions can be made to several home games where a lower demand is expected. Please send your demand timely before the respective matchday ticket sale has started via e-mail to the FC St. Pauli Servicecenter. HERE you will get more information to group orders. IS IT CORRECT THAT I CAN’T BOOK TICKETS FOR THE SÜDTRIBÜNE ONLINE? Tickets for the terrace in the Südtribüne (south stand) can only bought directly at the FC St. Pauli Kartencenter. A purchase via the ticket onlineshop is not possible. For each game there are a limited number of matchday tickets that can be purchased at the Kartencenter during the communicated sale dates. Every person who wants to attend a home match of FC St. Pauli in the Millerntorstadion needs a ticket except children including 6 years. Children of this age can visit the stadium for free and don’t need an own ticket. Children which are 7 years and older need a ticket and won‘t come to the stadium for free. CAN I BUY TICKETS BY TELEPHONE? You can conveniently pay the invoice amount by direct debit from your current account. The direct debit authorization is issued solely for this payment transaction. With giropay you pay directly per online wire transfer. Giropay is available for customers of Sparkassen, Volks- and Raiffeisenbank, direct banks and the Postbank. Of course we also accept payment with Visa, MasterCard and American Express credit cards. The shipping & payment method is selected in the second step of the booking process. Please note that your information must be complete and correct so that a successful booking of the tickets can be guaranteed. If your details are complete and correct, please confirm your details by clicking once on continue to verification. WHERE ON MY CREDIT CARD IS THE CHECK DIGIT ? The card check digit at VISA includes the last three digits of the numbers in the signature field on the back of the credit card and MasterCard the last three digits next to the signature field. For American Express, this is the 4-digit number printed on the front, right, or left side of your credit card. HOW SAFE IS A BOOKING FROM THE TICKET ONLINESHOP? The booking of tickets in the ticket-onlineshop is secured by SSL encryption. This is usually recognizable for you by the internet address beginning with "https://". The "s" is the mark for the SSL encryption of the data. Basically tickets ordered via the ticket-onlineshop are sent by post, but people from abroad actually have only the opinion to book tickets on deposit. Also tickets bought on our official secondary market (Clubsale) are deposited if a delivery by post is no longer possible. Please check the invoice or confirmation e-mail to assure if a ticket was booked on "Hinterlegung (Pick Up Foreign Order)" or "Versand (shipping)". Deposited cards can be picked up during regular opening hours at FC St. Pauli Kartencenter. On matchdays, a pick-up is only possible at the ticket counter in the Gegengerade (back straight), which opens two hours before kick-off. The possibility to print out your ticket (print@home-ticket) is usually offered for test matches but not for league matches. The option of mobile tickets is currently not used. When you book a ticket on Hinterlegung (Pick Up Foreign Order), they are usually 5 working days after your order process at the FC St. Pauli Kartencenter ready for collection. A collection date will be published in the sales news and on the invoice. IN WHICH COUNTRIES TICKETS WILL BE SHIPPED? Delivery by post is only possible within Germany. All orders from abroad will be deposited at the FC St. Pauli Kartencenter and can be picked up during the regular opening hours. On matchdays, deposited tickets are ready for collection at the ticket counters in the Gegengerade. When picking up the tickets, a valid photo ID of the customer must be presented. From season 2018/19 FC St. Pauli will start with Clubsale a new secondary market solution in cooperation with Eventim Sports. Clubsale will replace Fansale as the official ticket Exchange of the club. As a ticket holder you can offer your ticket for resale directly in the ticket onlineshop of the FC St. Pauli - safe and reliable. The integrated solution automatically handles the resale process in the background. As a season card holder (Dauerkarte/Jahreskarte Steh Süd) you also have the advantage of keeping your ticket instead of handing it out to others. Due to the high demand for tickets, the chances of a successful resale are extremely good: In season 2017/18, 98% of all tickets offered on Fansale were sold successfully. Anyone who wants to sell a ticket online has to use Clubsale as the official resale platform. The sale of tickets on unauthorized online and ticket platforms such as Viagogo, eBay or eBay Kleinanzeigen is forbidden. HERE you will find a detailed description of how to sell a ticket on Clubsale. As a ticket seller, you log in with your known access data in the ticket-onlineshop. Tickets can only be offered on Clubsale if you log in with the access data you used for the order.A new registration in the ticket-onlineshop leads to duplicates in the system and as a consequence the booked tickets are not visible for resale. After a successful registration, a resale can be made under My account. Further information to the registration can be found in the FAQ at the top of this page. WHICH TICKETS CAN I OFFER? Basically, you can sell individual tickets of your season card (Dauerkarte/Jahreskarte Steh Süd) as well as seasonal packages (Saisonpakete) and matchday tickets.. Tickets can only be offered if you log in with the access data from your order. Otherwise you can't see your booked ticket under My account and there under secondary market In addition to tickes, which were booked online, also tickets ordered via the ticket hotline can be resold on Clubsale. HOW AND WHEN CAN I OFFER TICKETS? Tickets can be offered if the exact date of the match has been determined and only when the matchday ticket sale of the club has begun for the match.Clubsale will be activated by the club on the day of the member pre-sale. After successful registration, the ticket will be displayed under My account and there under secondary market - resell tickets. You have to use the switch to release the ticket for resale. After entering your bank details, the offer will be published and other supporters can book the match day ticket in the ticket-onlineshop. HOW DO I KNOW THAT THE TICKET WAS SOLD SUCCESSFULLY? If the ticket has been sold, the ticket seller will receive a confirmation e-mail. In the following, the season card (Dauerkarte/Jahreskarte Steh Süd) is blocked for the match or the match day ticket becomes invalid. Within 14 days, the sales proceeds will be transferred to your bank account. If the ticket sale wasn't successful or the possibility of Clubsale was deactivated by the club, the seller will also be informed via e-mail. The ticket will remain valid for the match. HOW LONG CAN I OFFER TICKETS ON CLUBSALE? A resale is possible until one day before the match, 11pm. After that Clubsale will be deactivated. On the day of the match, the possibility to sell the ticket on our official secondary market is not given. IS IT POSSIBLE TO CANCEL A TICKET OFFER? If the ticket hasn't been resold, the offer can be deactivated by the provider at any time. If you cancel the ticket offer, the ticket remains valid for the match. You will be always informed via e-mail if the sale was successful or not. HOW MUCH IS THE REFUND AND WHEN WILL IT BE MADE? In the case of a successful sale, the season card holder (Dauerkarte/Jahreskarte Steh Süd) receives the percentage share of the price which he/she has paid for one home match. Seasonal package (Saisonpaket) and matchday ticket holders will receive the regular matchday ticket price. As a result, each ticket seller receives the price paid by himself for the ticket. DO I GET A NOTIFICATION IF MY TICKET WASN'T SOLD? If there is no sale, you will be informed before the match via e-mail. Your ticket will remain valid for the match. You can also check under My account to see if your ticket has been sold. There you also have the opportunity to cancel your offer. Your ticket will remain valid. HOW CAN I BUY A CLUBSALE-TICKET? Alternatively, there is a filter function above the seat map. With the help of this function you will find out in which stands or blocks tickets are still available. Please use the function stadium area and there the all stands-filter to select the stand and after that the all tiers -filter to select the block. Behind the block there is the free number of available tickets. ARE THERE ANY FEES FOR BUYING A TICKET ON CLUBSALE? If you buy a ticket on the secondary market, you have to pay the regular matchday ticket price plus a service fee of 15 percent as well as fees for shipping or deposit. HOW DO I GET MY TICKET AS A BUYER? All tickets ordered via the ticket-onlineshop, also Clubsale-tickets, will be sent by post. Tickets can exclusively be booked on deposit if the match takes place in 5 days or less. Deposited tickets can be picked up on the matchday from two hours before kick-off at the ticket counters of the Gegengerade (back straight). 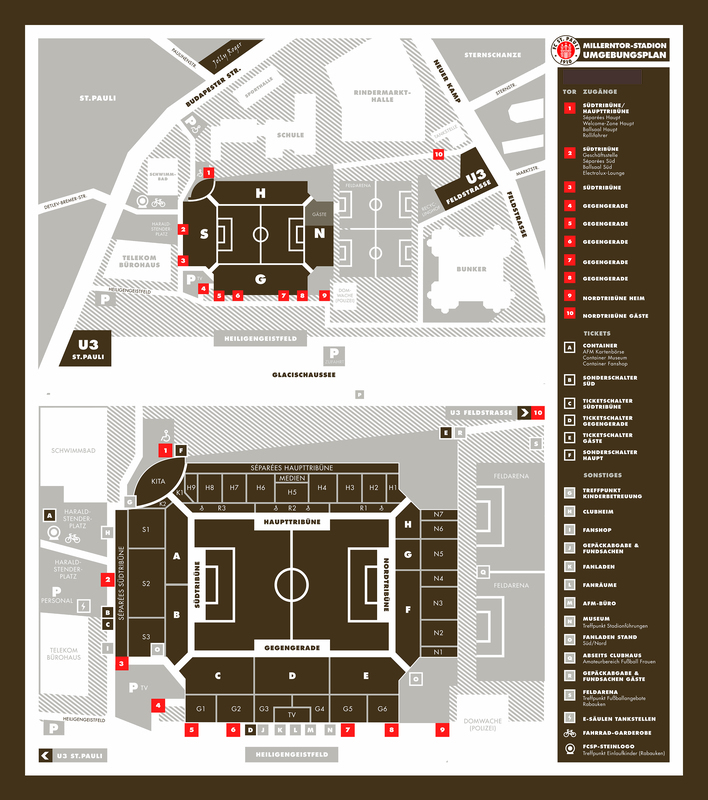 HERE you will find a map of the Millerntor-Stadion. WHY CAN'T I BUY MORE TICKETS? The maximum order quantity of tickets will be published in the sales news on our homepage. Usually it is possible to buy one ticket for the terrace and additionally up to three seats or a total of up to four seat tickets per person. These include the tickets purchased in the first sale and on the secondary market (Clubsale). For strongly or less demanded home matches, the sales regulations will be adjusted. Anyone who has already reached the maximum, can't buy more tickets in his name. If the limit of tickets was reached, you will get a notification of that. Anyone attempting to circumvent the maximum order quantity of tickets by creating new accounts on his name will offend against our General Ticket Terms and Conditions (CTTG). As a possible consequence, tickets will be blocked for the Access. Furthermore the club will impose contractual penalties and stadium bans.